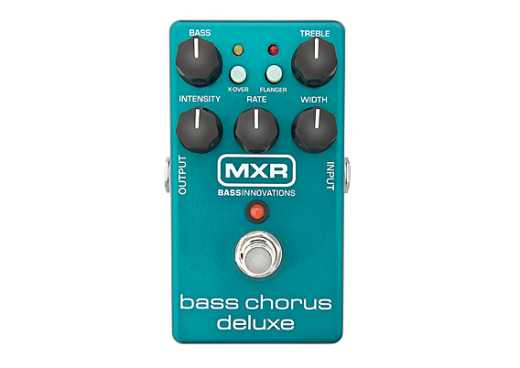 The MXR Bass Chorus Deluxe is powered by pure analog bucket-brigade technology, serving up shimmering, liquid chorus and swooshing, metallic flanger effects while preserving the punch and fundamental of your low end. The Bass Chorus Deluxe features top-mounted Flanger and X-Over buttons with LED status indicators. In X-Over Mode, modulation in low frequencies is decreased at 100Hzperfect for playing upper register chords, melodies and fills while keeping the low end in tune. With Bass and Treble controls you can cut or boost lows and highs and shape the tonal character of the effect. For a wide stereo sound, select the TRS (tip-ring-sleeve) Stereo Hardwire Bypass Mode via an internal switch. In this mode, you can use a TRS to TS (tip-sleeve) Y-splitter cable to send the effect signal to two different amplifiers, allowing the modulation to move from left to right. 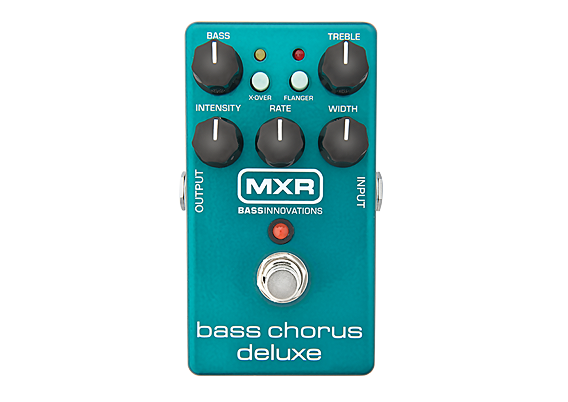 The Bass Chorus Deluxe joins the ranks of award-winning pedals in the MXR Bass Innovations line, each designed by bass players for bass players. I bought this pedal for my guitar setup. Yes it is a "bass" pedal, but I have to say it works really nicely with the guitar. Chorus is smooth from mild to intense levels. The guitar always shines through the mix and never gets swampy. No noise, dead quite. You can get a really nice smooth flange, all the way to very metalic flange. The X-Over button allows you to chug away (distortion) with clarity and still liquifies your fills, very brilliantly executed!!! A little expensive as far as a small pedal goes, bit this pedal goes the distance and then some. Cant see how anyone would be disappointed unless they dont want to hear their guitar shine with a smooth aquatic chorus. P.S. : I'm sure it's great for bass too LOL! The MXR Bass Chorus pedal is the best bass chorus I've owned. It retains the lows and enhances the highs of my bass sound without losing the sound of your bass and bass amp. It has easy to use control knobs and the X-over and Flanger effects are added bonus.